Salted Egg York Burger? Here's A Look At McDonald's New Menu! 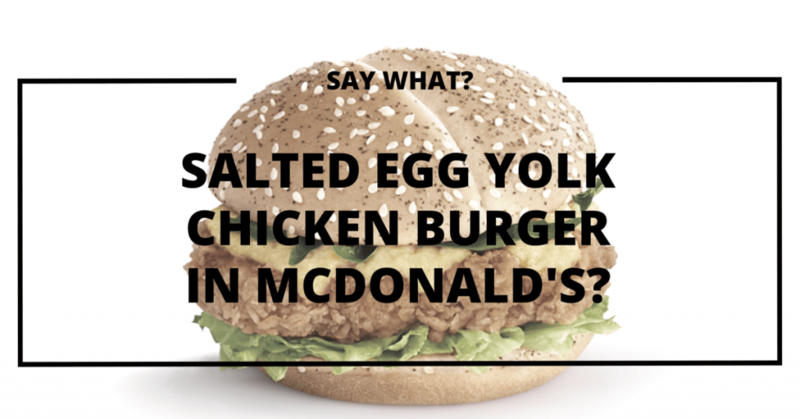 For those who haven’t heard, McDonald’s Singapore has officially recognised the popularity of salted egg yolk and will be releasing the Salted Egg Yolk Chicken Burger in its new locally-inspired menu. Say whaaaaat? We may not have Japan’s Mega Mac, but we reckon our new locally-inspired menu will nonetheless, keep us foodies satisfied. We may not have a crystal ball lying around, but the following menu will leave you hungry as a horse. Taking the first spot is, of course, the Salted Egg Yolk Chicken Burger. Proving that the salted egg yolk hype is here to stay, this burger is packed with curry leaves and is easily the main highlight on the menu. Seaweed Shaker Fries? How about some Twist & Shake Fries with Salt & Pepper Crab-flavoured Shaker instead? We’re telling you guys, these fries are IT. The Gula Melaka McFlurry, is, of course, a tribute a popular local flavour. Vanilla-flavoured and filled with bits of kueh lapis, we predict this will be a fan favourite, especially amongst sweet tooth fanatics. The fast food restaurant will also bring back two items on their menu: the Spicy McNuggets and Banana Pie. Can we get a hell yeah? The Spicy McNuggets are so spicy you won’t be needing chilli sauce. Given its previous popularity, the comeback of these nuggets is definitely a wise decision on McDonald’s part. Piping hot, velvety, and sugary, this Banana Pie tastes just like summer. The time-limited menu is available from today (30th June). Don’t worry, we’ll be praying for your waistline. Also, read 5 Local Eateries You Never Knew Are Owned By Celebrities!